Innsbruck – Holidays in the Capital of the Alps. Nowhere is the line between city and ountains so blurred as in Tirol’s capital. 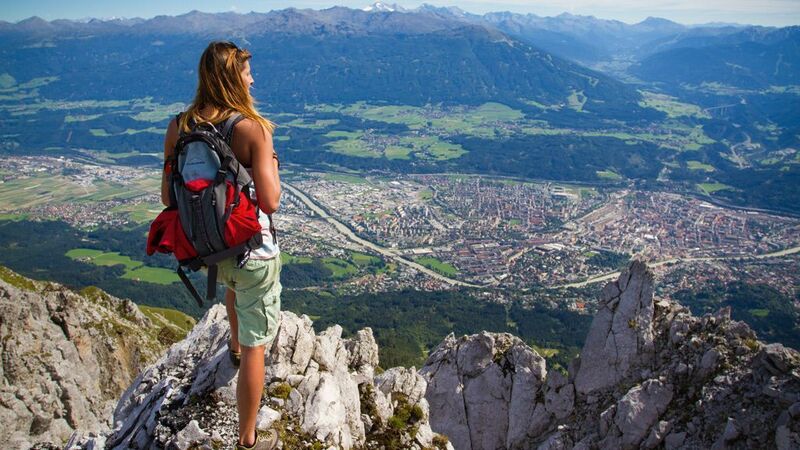 From outdoor sports to culture and back in one day: that’s Innsbruck. Innsbruck is the capital of the Alps. With the Nordkette Mountains in the background and historic buildings in town, Innsbruck is a unique destination for culture vultures and utdoor enthusiasts. One of the city’s most popular postcard subjects is the Bergisel Ski Jump, venue of the Four Hills Tournament. The ski jump’s restaurant offers magnificent views. Another popular attraction is the cutting-edge Hungerburg Funicular, designed by Zaha Hadid. With its cobblestone lanes, shops, cafés and the Golden Roof, Innsbruck’s makes for a great place to explore. The Alpenzoo is popular with families. In winter, Nordkette offers great skiing. From the city it’s a short drive by bus or Hungerburg Funicular to the mountain top offering spectacular views. Innsbruck is a heaven for culture and shopping. Going from ski boots to high heels is easy here: skiers and shoppers mingle in Innsbruck’s Maria-Theresien-Straße. It is this seamless blend of sports and lifestyle that makes Innsbruck truly unique. Innsbruck offers something for all tastes and pocketbooks, ranging from luxurious 5-star hotels to apartments and friendly B&Bs. Innsbruck's winter is made to measure for snowboard fans as the surroundings boast 9 scenic ski areas and 300 slope kilometers accessible with one skipass. All pistes are easy to reach with free skibus shuttles. Snowboarders appreciate this town as Freeride City offering pristine powder snow stashes. For example, Axamer Lizum has incredible 300 hectares of freeride terrain. Superb lines are also available at Stubai Glacier. Among the absolute highlights ranks Innsbruck's Nordkette mountain range as a true hot spot for freestyle fans. A snow park and cool beats add to a memorable snowboard vacation in Innsbruck. From your hotel right to the ski slope – a real paradise for snowboarders and fans of a lively nightlife: Innsbruck's old town offers myriad bars, pubs and restaurants after an exciting day in the mountains. Versatility. Ambiance. Innsbruck twice hosted the Olympic Winter Games. The 800-year-old town is renown as a cultural center, and as a city of numerous art treasures and many historic structures. Innsbrucks rich history is interwoven with that of the Habsburgs, whose wealth and sense of beauty left their mark: take the "Golden Roof", the "Black Men" bronze statues at the Court Church, the Imperial Court Palace and Ambras Castle. Battlefield of fights for freedom and Olympic medals. Big town shopping opportunities coupled with a great range of hiking. Tirolean nights, brass band concerts and baroque operas, lederhosen and dinner jackets. University town and convention center. Take advantage of the Innsbruck Card! The 800-year-old town is renown as a cultural center, and as a city of numerous art treasures and many historic structures. Innsbruck’s rich history is interwoven with that of the Habsburgs, whose wealth and sense of beauty left their mark: take the "Golden Roof", the "Black Men" bronze statues at the Court Church, the Imperial Court Palace and Ambras Castle. Take advantage of the Innsbruck Card! In the immediate surroundings you find the world-famous Bergisel Ski Jump (Four Hills Tournament in early January) and a variety of superb ski areas for winter sport fans of all skill levels. Coming from the East & West, take A 12 Autobahn (Vignette Toll Sticker required). Arlberg Tunnel is a toll tunnel. Coming from the South, take A 13 Brenner Autobahn (Toll Motorway) or B 182 Federal Road across Brenner Pass. Innsbruck is readily accessible by a dense network of highly connected streets and roads. Coming from Osttirol, drive across Felbertauern Tunnel or through Pustertal Valley (Italy). Bus Service to the surrounding Village Resorts and to South Tyrol - Buses are departing from the Bus Terminal at Innsbruck Main Train Station. International Railroad Schedule - Innsbruck is readily accessible by rail from all European capitals.